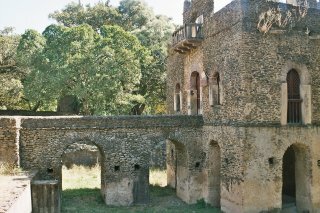 Fasil Ghebbi, Gondar Region, are the remains of a fortress-city that was the residence of the Ethiopian emperor Fasilides and his successors. 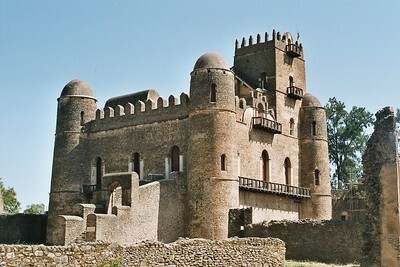 The founder of Gondar was Emperor Fasiladas who, tiring of the pattern of migration that had characterised the lifestyle of so many of his forefathers, moved his capital here in 1636 AD. By the late 1640s he had built a great castle here, which stands today in a grassy compound surrounded by other fortresses of later construction. In addition to this castle, Fasiladas is said to have been responsible for the building of a number of other structures. Perhaps the oldest of these is the Enqulal Gemb, or Egg Castle, so named on account of its egg-shaped domed roof. Other buildings include the royal archive and the stable. Beyond the confines of the city to the north-west by the Qaha River there is another fine building sometimes associated by Fasiladas - a bathing palace. The building is a two-storeyed battlemented structure situated within and on one side of a rectangular pool of water which was supplied by a canal from the nearby river. The bathing pavillion itself stands on pier arches, and contains several rooms which are reached by a stone bridge, part of which could be raised for defence. My first view of Gonders heydays fell upon Fasiladas Baths. This pool lies in a rustic setting somewhat out of town. Sitting on the steps leading to the water, you can only imagine how it looks like during a major religious festival. In the center of town you find the Royal Enclosure. Here four castles and several other buildings from the 17th century remain. Still the most prominent one is that of King Fasilades himself. Round shaped towers characterize this European / Moghul looking castle. The whole historic area is amazing, and a pleasure to be in. Gonders modern town is also a nice place to spend a few days. The road from the south from Bahir Dar goes along Lake Tana up to Gondar. Along the way is a heritage site that has ruins left from a 1500's castle with Portuguese influence where you would never expect to see it. 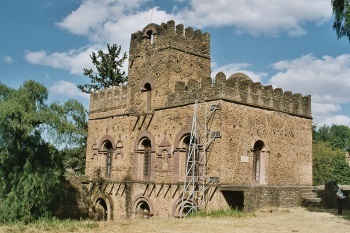 Entering Gondar and seeing this magnificent and very much in tact site with many buildings was well worth the trip. And there are otehr things to do around this area including the famed Church with the angel faces. 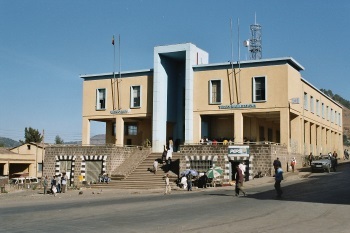 Fusion: Gondarian style: buildings marked by Hindu and Arab influences, subsequently transformed by the Baroque style brought to Gondar by the Jesuit missionaries.